An Australian-first study shows that not all parents understand the importance of helmet use in children, with a worrying number of children under four riding scooters without a helmet. Researchers from Neuroscience Research Australia (NeuRA), Sydney Children’s Hospital, Randwick and UNSW Sydney reviewed the cases of more than 300 children who presented to emergency departments following injury caused while riding bicycles, scooters or skateboards. Parents were found to be the biggest influence on children wearing helmets, followed by their peers and celebrities. Dr Susan Adams, trauma surgeon at Sydney Children’s Hospital, Randwick and study lead says that children should wear a helmet at all times when riding, irrespective of a child’s perceived level of experience. “More than 30% of non-helmet users in the study believed helmets were only required in certain situations, with a further 30% not wearing helmets due to their perceived expertise,” said Dr Adams. Helmet use decreases the chance of head injury in riders by 61 percent, facial injuries by 33 percent, as well as lowering the chance of fatality by 65%. Younger children are already at higher risk of injury due to lack of skill, poor capacity to judge road traffic, an underdeveloped neuromuscular system and a higher centre of gravity which increases their risk of injury from a fall. “Head injuries are associated with increased risk of hospitalisation and mortality, with potentially long-lasting negative effects on a child’s quality of life and transition into adulthood,” said Dr Adams. “We were pleased to see relatively good helmet use in mid-childhood and for bicycle riders, and also in specified riding areas such as skate and bike parks, however, this waned as children hit adolescence. Falls associated with riding bikes, scooters and skateboards are known to be a leading cause of hospitalisation in children aged 10-14years. “Parents need to ensure their kids are wearing a well-fitted helmet every time they ride their bike, scooter or skateboard,” added Dr Adams. 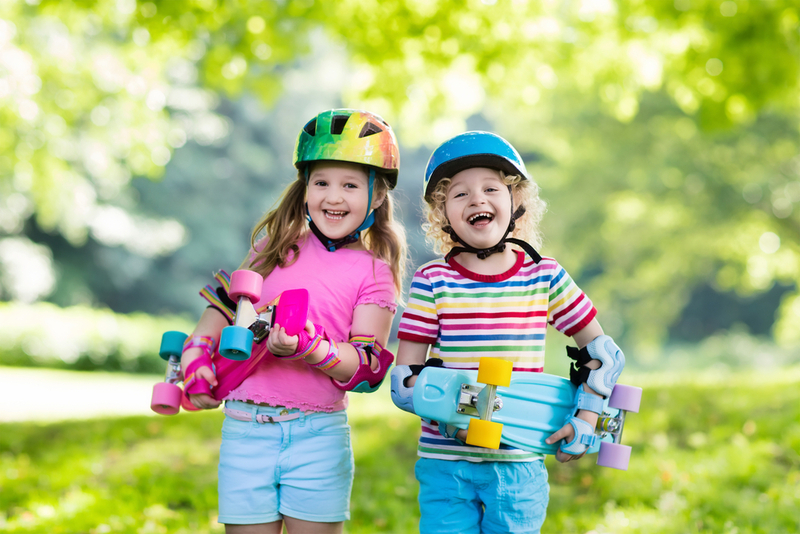 NeuRA child safety and injury prevention expert, Associate Professor Julie Brown stressed the greatest influence on a child’s attitudes to helmet use is parental rules. “It is important for parents and guardians to implement helmet rules early on in order to establish habit,” said A/Prof Brown. “Our study also found that children can be easily influenced by peer-pressure or well known ‘experts’ and celebrities not wearing a helmet.